Frederick Charles Wickstead was born in Preston Plucknett in 1897, the son of navvy, later timber merchant's labourer, Lewis Wickstead (1858-1924) and Sarah Ann née Norman (1857-1927). Lewis and Sarah were to have seven children: Edith Mabel (1884-1956), Edwin (b1894), Harold (1894-1917), Frederick Charles, Mildred A (b1892), Ethel Florence (b1902), plus another child whose name is unknown who died in infancy. In the 1901 census the family were listed at Preston Plucknett, as they were in 1911 - at which time 14-year old Frederick was employed as a 'Garden Boy' on the Brympton Estate. Frederick's service history at first appears to be somewhat tangled; he is known to have enlisted in the Dorset (Queen's Own) Yeomanry. From his Service Number 230748 we can deduce that he enlisted at the end of 1914 probably at Sherborne and, from his later postings, we may also surmise that he enlisted in the 1st Battalion. 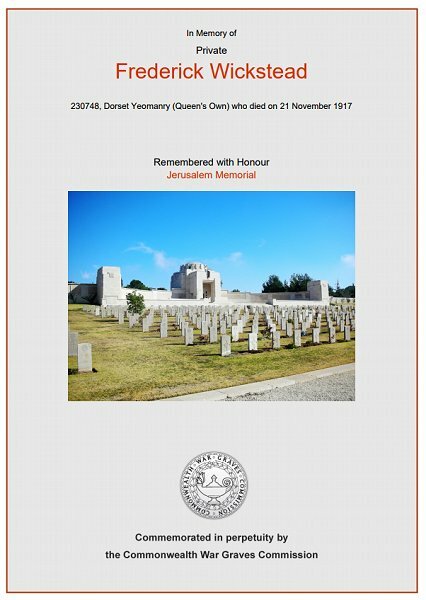 However in the notice of his death, the Western Gazette reported that of his two and a half year's service "two years have been spent in France" - which seems strange when none of the Dorset Yeomanry regiments were in France for that period. Of course, it may be that Frederick served for two years with another regiment but the Western Gazette may have confused his service with one of his brothers. Certainly Frederick's Service Number indicates enlistment with the 1st Battalion, Dorset Yeomanry, and his death during the Battle of Nebi Samwil indicates service with the same battalion. The following account therefore assumes that Frederick was a member of the 1st Battalion, Dorset Yeomanry throughout his service. The 1st Dorset Yeomanry were formed on 4 August 1914 at Sherborne and attached to the 1st South Western Mounted Brigade. In September 1914 they became part of 2nd South Midland Mounted Brigade (replacing the Oxford Yeomanry), in 2nd Mounted Division stationed in the Churn area. In November 1914 the Battalion moved to the Fakenham area for further training. In March 1915, the 2nd Mounted Division was put on warning for overseas service. In early April, the Division starting leaving Avonmouth and the last elements landed at Alexandria, Egypt, before the end of the month. By the middle of May, the Divisional Headquarters were at Cairo. On 10 August 1915, the Division was reorganized as a dismounted formation in preparation for service at Gallipoli. Each Yeomanry Regiment left a squadron headquarters and two troops (about 100 officers and men) in Egypt to look after the horses. The division landed at 'A' Beach, Suvla Bay, on the night of 17 August / morning of 18 August and moved into reserve positions at Lala Baba on the night of 20 August. On 21 August it advanced to Chocolate Hill under heavy fire and took part in the attack on Hill 112. Due to losses during the Battle of Scimitar Hill and wastage during August 1915, the Division had to be reorganised. On 4 September 1915 the 1st Composite Mounted Brigade was formed from the 1st, 2nd and 5th Mounted Brigades, and the 2nd Composite Mounted Brigade from the 3rd and 4th Mounted Brigades. Each dismounted brigade formed a battalion sized unit. The Gallipoli Campaign, also known as the Dardanelles Campaign, was a campaign that took place on the Gallipoli peninsula in the Ottoman Empire between 25 April 1915 and 9 January 1916. The peninsula forms the northern bank of the Dardanelles, a strait that provides a sea route to what was then the Russian Empire. Intending to secure it, Russia's allies Britain and France launched a naval attack followed by an amphibious landing on the peninsula with the eventual aim of capturing the Ottoman capital of Constantinople (modern-day Istanbul). The naval attack was repelled and, after eight months' fighting, with many casualties on both sides, the land campaign also failed and the invasion force was withdrawn to Egypt. The campaign was one of the greatest Ottoman victories during the war and a major Allied failure. The Division returned to Egypt from Gallipoli in December 1915 and was reformed and remounted. The artillery batteries and other units left in Egypt rejoined the division between 10 and 20 December 1915. However, the dismemberment of the Division began almost immediately as units were posted to the Western Frontier Force or to various other commands. The 2nd South Midland Mounted Brigade left the Division on 17 January 1916 and was sent to the Western Frontier of Egypt as an independent formation. It was redesignated as 6th Mounted Brigade in April 1916 and served with the Western Frontier Force from January to October 1916. The Western Frontier Force was a force of British Empire troops formed in response to the Senussi Uprising and coming under the command of the Egyptian Expeditionary Force. Orders for the formation of a Western Frontier Force were issued on 20 November 1915, and Major-General A Wallace, CB, was appointed to the command. The 1st Dorset Yeomanry joined the Imperial Mounted Division in January 1917. The complete Brigade was transferred to the newly formed Yeomanry Mounted Division on 27 June 1917, joining it at el Maraqeb. From 31 October it took part in the Third Battle of Gaza, including the Battle of Beersheba and the Capture of the Sheria Position. It took part in the Battle of Mughar Ridge on 13 and 14 November and the Battle of Nebi Samwil from 17 to 24 November. The Action of El Mughar, also known as the Battle of Mughar Ridge, took place on 13 November 1917 during the Pursuit phase of the Southern Palestine Offensive of the Sinai and Palestine Campaign. Fighting between the advancing Egyptian Expeditionary Force (EEF) and the retreating Yildirim Army Group, occurred after the Battle of Beersheba and the Third Battle of Gaza. Operations occurred over an extensive area north of the Gaza to Beersheba line and west of the road from Beersheba to Jerusalem via Hebron. Strong Ottoman Army positions from Gaza to the foothills of the Judean Hills had successfully held out against Allied forces for a week after the Ottoman army was defeated at Beersheba. But the next day, 8 November, the main Ottoman base at Sheria was captured after two days' fighting and Turkish units along the whole line were in retreat. The Allies attacked the Ottoman Eighth Army on an extended front from the Judean foothills across the Mediterranean coastal plain from 10 to 14 November. The Battle of Nebi Samwil, part of the Jerusalem Operations, ran from 17 to 24 November 1917. General Allenby had decided to attack the Turkish Seventh Army and occupied Jerusalem. This necessitated an advance through the difficult country of Judaea and Allenby's plan of attack was to move through the Judaean hills and break out onto the main Jerusalem-Nablus road, cutting off the Turks in Jerusalem. The British moved on 16 November to take up a line on a range of low, stony hills to the east of Junction Station and remained in this position throughout the 17th, when the operations began. The infantry advance began on 19 November and, according to the Regimental History of the Somersets who were also in the battle "There was heavy driving rain as the troops moved forward and mist covered the battlefield, but with great dash the attacking waves advanced and completely drove the Turks from their positions in front of Enab. For two hours during the early morning of 21 November the village of Enab was shelled heavily by the Turks and, owing to the congested state of the village -packed with troops and animals - casualties were heavy. It was during this fire-fight that Frederick Wickstead was killed in action in the Battle of Nebi Samwil on 21 November 1917. He was 30 years old. Other Yeovil men killed in this battle were Edward Bell, Harry Holland, Wilfred Purchase, Thomas Luxton and Frederick Barnes. The Western Gazette reported on 7 December 1917 "Mr and Mrs Wickstead, of this village [Preston Plucknett], have received an intimation from the War Office, to the effect that their third son, Private Fred Wickstead of the -- Battalion, Dorset Yeomanry, has been missing after an engagement on 21 November. Before joining up, Private Wickstead was employed as a gardener on the Brympton Estate, and has been in the Army two and a half years; of that period two years have been spent in France. Mr and Mrs Wickstead have two other sons serving, one of them Private Harold Wickstead was killed about 2 months ago and the other, Sergeant Edward Wickstead, who is an old soldier, is in France." Frederick Wickstead is commemorated on Panel 3 of the Jerusalem Memorial and his name is recorded on the Preston Plucknett War Memorial. 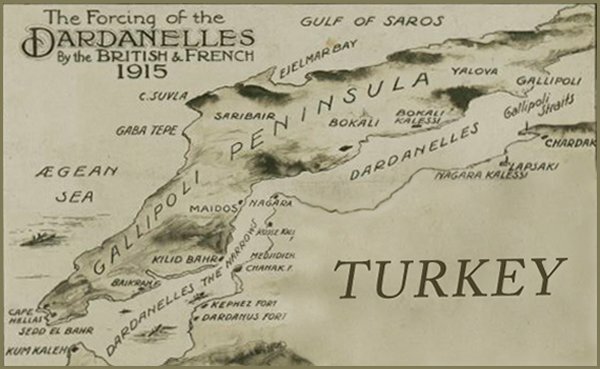 A postcard dated 1915 showing a map of the Dardanelles Campaign. The Commonwealth War Graves Commission certificate in memory of Frederick Wickstead.